In an effort to provide our patients with the highest quality care available, we have invested in state of the art diagnostic testing instruments. Sophisticated care close to home. 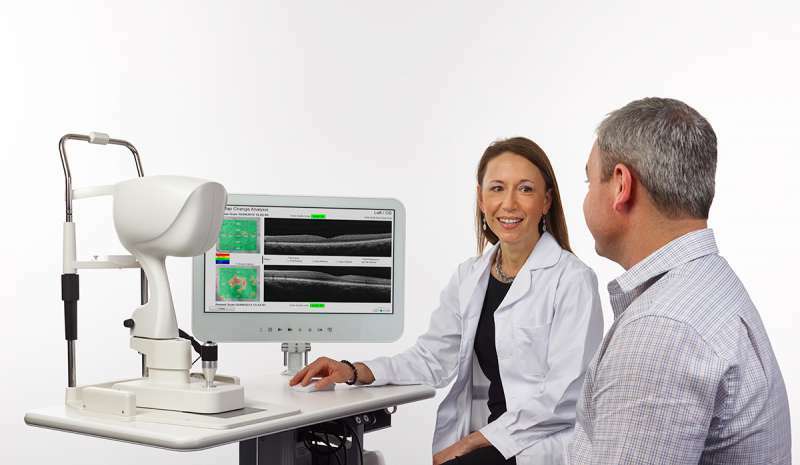 Our digital retinal camera allows photos of the back of your eye to be taken. Utilizing this technology we can take a closer look at the retina. It also provides a great baseline to monitor any changes that may occur from year to year. This painless test is invaluable in diagnosing and treating patients with Glaucoma. Through a series of flashing lights it accurately measures and maps out your peripheral vision. This technological breakthrough uses a scanning laser to give an elevation map or cross section of the retina (the tissue located at the back of the eye). This instrument is useful in monitoring Macular Degeneration, Diabetic Macular Edema as well as Glaucoma. Our investment in the Lenstar LS 900 takes nine different measurements in a single scan that lasts a few seconds. These measurements are imperative prior to cataract surgery for correct placement of the intra ocular lens. This laser procedure is done in office under the guidance of our ophthalmologist. This laser is guided to the “drain network” of the eye and stimulated to help it perform more efficiently. This procedure has a very low complication rate and it may help patients eliminate the eye drops they are using. Email us today to learn more about our diagnostic testing.